Just the hits. 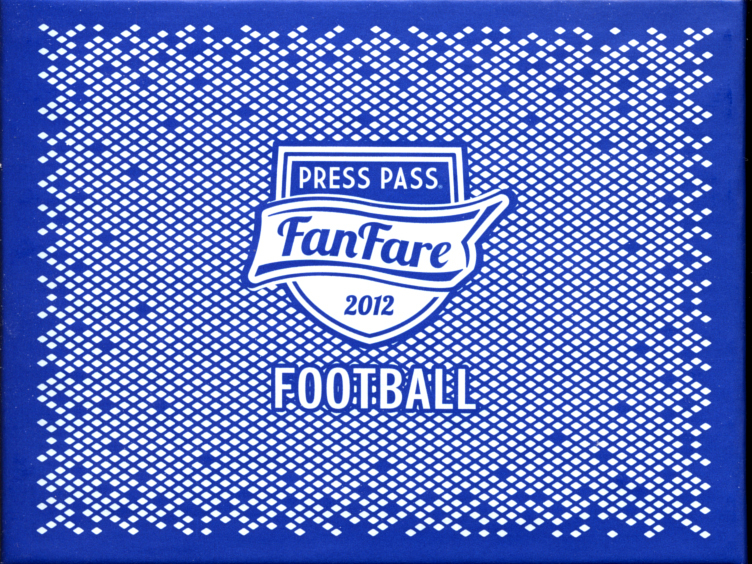 That is what you will find in boxes of 2012 Press Pass FanFare Football. 5 cards, all autographs. With a high percentage of first round draft picks, this is a good bet for pre-season prospectors. 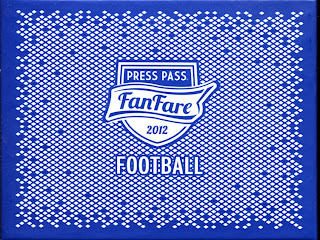 2012 Press Pass Football fits our Premium cards category nicely. 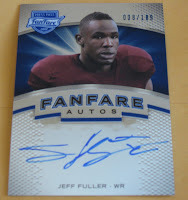 Each hobby box contains 5 autograph cards. 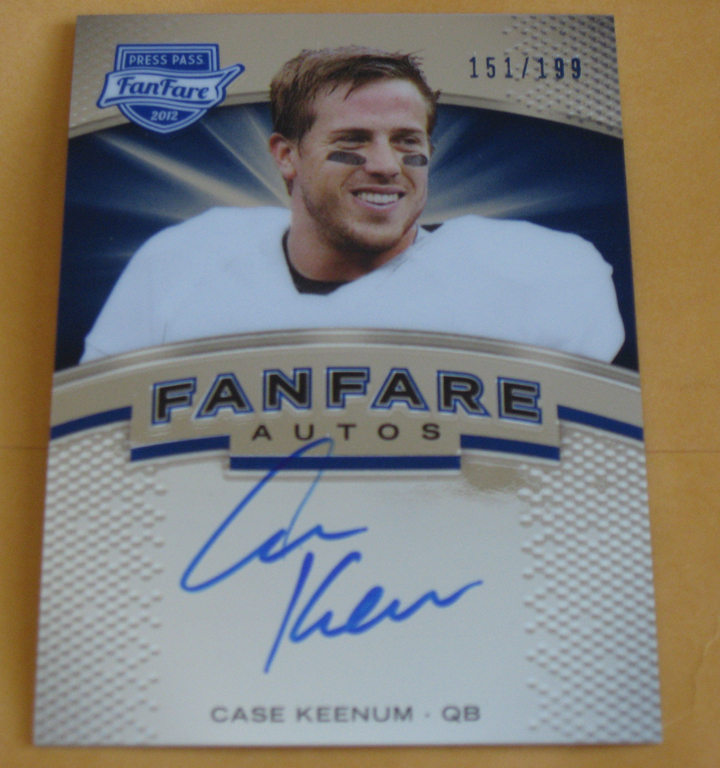 Here are the card we found in our box. These cards are impossible to scan with their wall-to-wall Chromium technology. (If anyone has any neat tricks for scanning chrome/mirror/foil cards, please pass them along.) 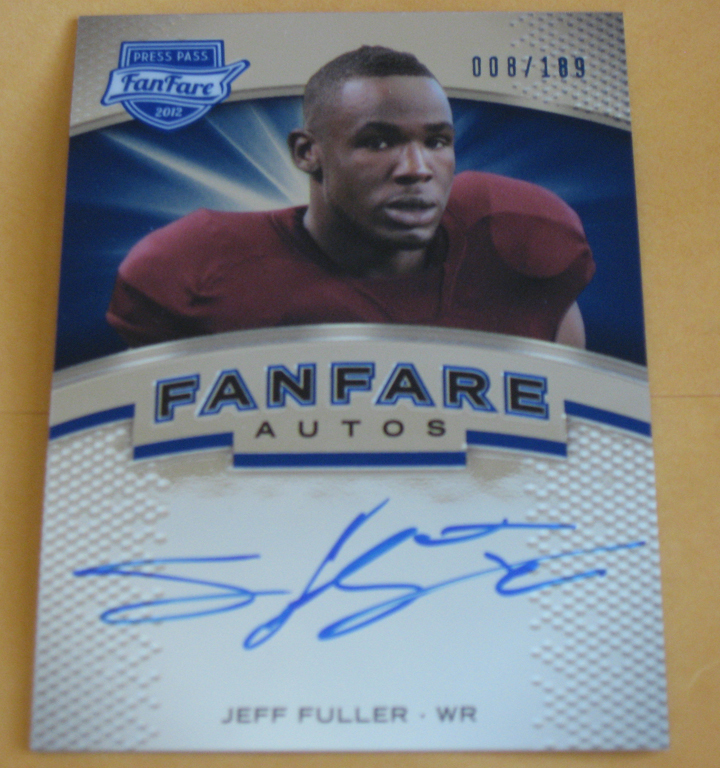 The pictures do not quite capture how impressive these cards look in person, on the front, at least. Turn over the card and you have a repeat of the picture with a congratulatory /authenticity statement. Nothing more. When these types of hit cards are part of a large set of regular trading cards, it is a non-issue. As a stand alone set, it feels somewhat lacking. This is a short list with plenty of potential include anticipated standouts including Andrew Luck, RG3 and Trent Richardson. Short of the back of the card design issue, these are very satisfying hits to pull and will get rookie speculators excited. This could wind up like candy, a sweet treat, for those willing to take a chance, or even potato chips, you can’t just stop at one, for those who like to go for the win. 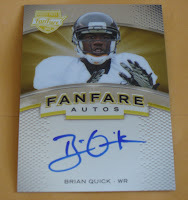 2012 Press Pass FanFare Football might have worked better as the hits for another series of cards, but still works well for those looking to pull some nice on-card autos.